Here are pictures of glamming up with strings of pearls from my past projects. Give it a try — you might really like the effect. I have written about quilting circles in the past here. So, curious mind wants to know if you are a pearl necklace person. I am generally not the necklace type, but I am definitely the earrings type. So I am definitely into pearl earrings! Thank you for stopping by. I hope you all have a Happy Monday, and a Happy Week! 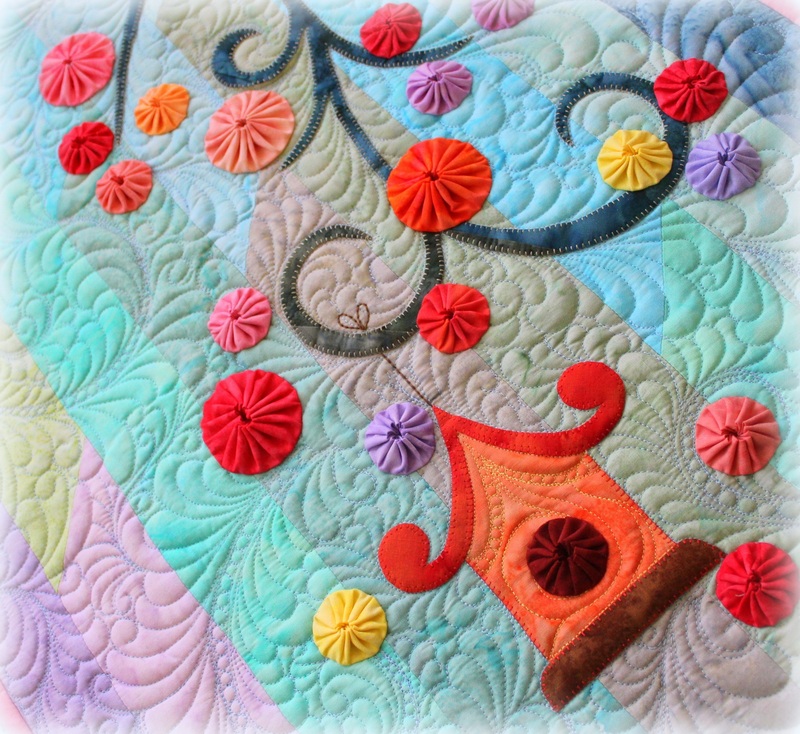 This entry was posted in Quilting, Thread Talk and tagged Free Motion Quilting is FUN!, Free-motion quilting tips, Quilting Circles, Wendy Sheppard and Free Motion Quiting. Bookmark the permalink. 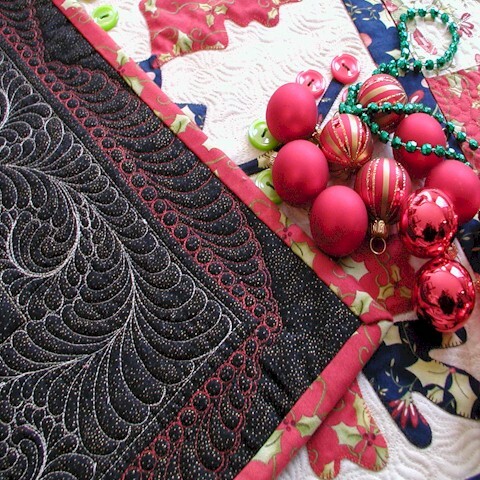 I love how your ‘pearls’ dress up your quilts. Used to wear pearls to church when I was a teenager, but got out of the habit when little gold chains became popular. 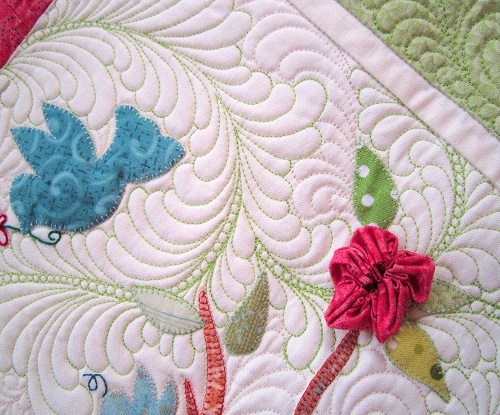 I love Thread Talk and seeing all the beautiful things you can do with quilting! Can a person make pearls with a DSM or is that only for those that have long-arms? A beautiful strand of pearls was my husband’s gift to me on our wedding day. Since next summer we will celebrate our 50th anniversary, yes — I do still wear pearls (although not as often as I did back then). Oh I’m so envious of your quilting!!!! Yes I love pearl necklace and earrings especially since that was the last gift I got from my hubby before he died a few months later. Wendy, love the birdhouse with the yoyo’s all over the top. Really cute! Your quilting is lovely and beautiful just like pearls. I continue to wear pearls, but not the strand that my husband gave me more than fifty years ago, that I wore at our wedding. I now wear a single pearl, my pearl ring, or pearl earrings, or……… Pearls are my favorite, so delicate and feminine. It is also my birthstone. Lucky me!! Love these quilted pearls!! Born in June I am a “pearl girl”!! Love wearing them because they make me feel like a grown up!! 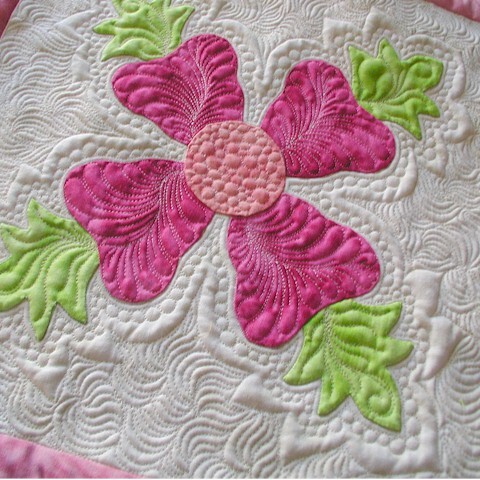 Such Beautiful quilting..it is Art for sure, I hope to be able to do 1/2 this good someday! 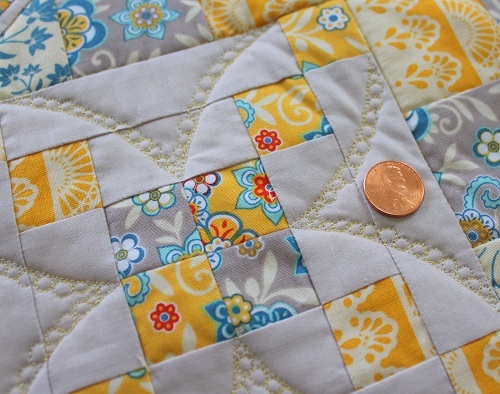 Gorgeous projects and quilting. I’ve done some pearls within feather stems a few times, and like the effect. It does add a touch of classic elegance. I don’t have real pearl strands, and don’t wear my pearl ring anymore, because it’s so delicate, and I tend to forget when I’m dealing with water. I do have a diamond heart necklace I wear often, and Claddagh earrings I wear daily when I’m going out. Diamond is my birthstone, hearts are my favorite shape, and the Claddaugh represents my Irish heritage. I tend to think they’re my signature pieces. Have a wonderful night! Your quilting is spectacular! I did a small quilt with circles and really liked the effect, but my stitches were horrible. I finally decided to stop trying to free motion quilt and stick to my walking foot, although I do love to do free motion machine embroidery! I also love pearls! But am not much of a jewelry person. 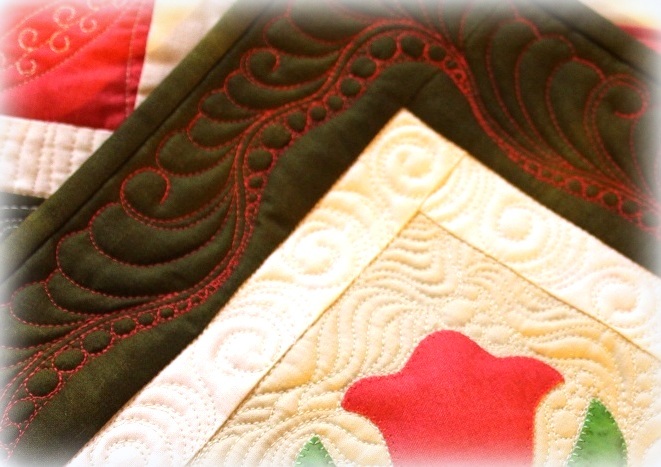 Thank you for sharing all of your fabulous quilts and quilting, I really enjoy browsing. Have a wonderful creative day! 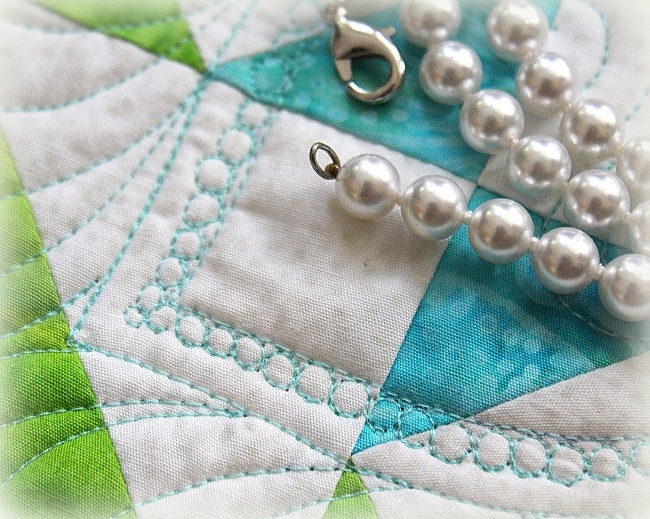 Thanks for your ideas on using pearls in quilting, Wendy. I do pebbles a lot, but not pearls. My mom always loved pearls, and have inherited the pearl strands my dad gave her through the years. I always feel close to her when I wear them. Oh, my goodness, you are SUCH an inspiration! My first blog read of the morning and I want to jump right up and get to work! I like earrings but I don’t wear them. I’ve never had a desire to have pierced ears, and the clip-on kind gets uncomfortable after a while. I love necklaces and brooches, however, and have more than I can keep up with. I do have a set of pearls but haven’t worn them in a long time – I am not sure why! I love little pearls in craft projects as well. One corsage that my son got for a date to a school banquet had little sprays of fake pearls in it and I just loved how they looked. beautiful! I love pearls and pebbles on quilts.